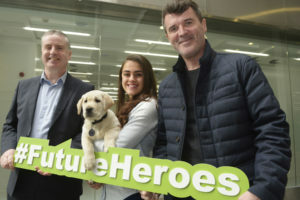 Roy Keane travelled to the Tyndall National Institute, Cork to mark the launch of Irish Guide Dogs for the Blind Annual Heroes Appeal which starts on April 6th. The Annual Heroes fundraising Campaign will see volunteers and staff collecting nationwide to raise much-needed funds to support the organisations work with people who are blind or vision impaired and families of children with autism. The funds raised will go towards training Guide Dogs and Assistance Dogs. Tyndall National Institute, as world leaders in Nano Technology, was chosen as the location for the launch as they are supporting Irish Guide Dogs for the Blind in developing new sensor based technologies that they hope will support training and help create more life changing Guide and Assistance Dogs partnerships. Roy continues “This project will help us create more Future Heroes! I’m asking the public to please support Irish Guide Dogs so that more people can enjoy the freedom and independence that these wonderful dogs provide”. The project with Tyndall titled Guide Dog 4.0 is designed to support Irish Guide Dogs for the Blind in identifying potential Guide and Assistance Dogs earlier in the training process, to remotely monitor dog health and to help shorten the period taken to train a Guide or Assistance Dog. One of the many benefits of this work is that it will reduce the amount of time which Clients will wait for one of what are life changing services. The project is looking at sensor based wearable technology that will isolate specific readings from the dogs. This data will then support trainers in better understanding the dog’s behaviour leading to better outcomes from the training process. Padraig Mallon, CEO of Irish Guide Dogs for the Blind says “Our goal is to raise more than €150,000 from our HEROES appeal. Every donation helps us to train more Guide and Assistance dogs. We see every day the life changing effects our dogs have on our Clients and we understand how hard it is for those waiting for our services. We want to get to these people sooner and the funds raised in April will be a great help. Padraig continues: “When we set out on a national appeal of this scale it is important we recognise the hard work that goes into it from our Staff, our Volunteers and Clients who will be on the streets, shops and workplaces doing their best to make it a success. We are very grateful to them, to Roy Keane and to Ford Ireland – we have a great team. This year’s HEROES appeal is also being supported by Ford Ireland as part of an expansion of their already strong links with Irish Guide Dogs for the Blind. Speaking at the recent announcement of the partnership renewal, Ciarán McMahon, Chairman and Managing Director of Ford Ireland, said: “We are hugely proud of the long-standing partnership with Irish Guide Dogs – the charity’s work is literally life-changing for the hundreds of people throughout the country who have a Guide or Assistance Dog that has been trained by Irish Guide Dogs. We are delighted to support the staff and volunteers at Irish Guide Dogs in the valuable work they do”. Irish Guide Dogs for the Blind is a national charity which provides vital services to blind or vision-impaired people and families of children with autism to enable them to achieve increased mobility, independence and an improved quality of life. It costs over €5.4 million to fund Irish Guide Dogs annually and with less than 15% of this coming from statutory agencies the organisation and its volunteers are working every day to raise the remaining €4.5 million required. Some Client Stories showcase the benefits working with a Guide Dog can have for people in their everyday life. Simple tasks a sighted person may take for granted could prove a barrier to a person who is blind or vision impaired. Our Clients have managed to overcome these and other challenges with the help of their Guide Dog partner and have succeeded in work and life. Kevin Kelly’s philosophy in life is “get up and get on”. Despite losing his sight in his teens, Kevin left his home town in Donegal to study in Dublin. His first year in university was difficult as he was not familiar with his surroundings. But this all changed when Kevin got his first Guide Dog, Miles. With Miles as his guide, he explored Dublin city and socialised with friends. Kevin and Miles explored the corridors of Leinster House where Kevin worked for a time as Parliamentary Assistant to Senator Mary Ann O’ Brien. Since then Miles has retired and Kevin has trained with his new Guide Dog Vann. Kevin is now the Advocacy and Communications Manager with the Asthma Society. Before Kevin lost his sight he was an avid soccer player. Three years ago he rekindled his love of playing football by joining the Blind Football Ireland squad. Besides playing competitively, there is a great sense of camaraderie amongst the team. “When friends see us play they are amazed at our pace and high level of skill). Kevin believes staying fit and active is great for stress relief, enabling a “get up and get on” attitude to life. Kevin values the support he has gotten from Irish Guide Dogs and he is encouraging others to come out and support their annual HEROES appeal so that more Guide Dogs can be trained to benefit other persons with vision loss just as Vann now benefits Kevin Kelly. From a young age Donnacha McCarthy became all too familiar with overcoming challenges in life. Having battled leukaemia at the age of ten he lost his sight. With the help of Irish Guide Dogs he regained his independence through long cane training and learning independent living skills. He later went on to train with his guide dog, Holly. As a child, Donnacha was an avid GAA football player. His sporting days seem to have come to an end when he lost his sight. However, in recent years he joined the Blind Football Ireland squad. He worked hard to develop his health and fitness. He has since seen Holly retire and she is now enjoying retirement with his sister. Donnacha has now been retrained with Guide Dog Aero and is working with Vodafone Ireland and continues to live in Dublin.